The wonderful light weight Burro travel trailers are made of a double shell construction with foil backed fiberglass insulation between the inner and outer shell providing protection from moisture and temperatures. It has a gel coat finish that is rivet less to eliminate leaks in the fiberglass; which is also easy to clean and maintain. The Burro's cupboards, countertops, seats and storage areas are molded into its shell. They are made with a fire retardant resin with a glossy white finish that is easy to clean. These lightweight travel trailers are reliable, durable and very easy to tow. 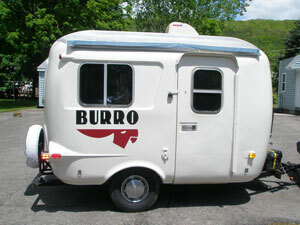 The company offers many options and can customize your Burro to make it just the way you'd like it. Many factory options are included such as: full size bed and dinette, fresh water tank, ice box, range, sink, closet, some cabinets, a propane tank, and an 110V circuit breaker with 12V fuse box. Additional options include: A three-way refrigerator, shower, hot water heater, and toilet (some models) porta potti, range hood or exhaust fans, kitchen window, heater with thermostat, roof air conditioner, TV antenna, awning, shelf and door racks, recessed lighting (anniversary models), sliding windows and more. The Burro is available in several lengths. A 17 feet 8 inch long that is 7 feet 6 inches wide and 7 foot 10 inches high weighing 1800 pounds with a hitch weight of 125 pounds; also available is a 14 foot 8 inch length that is also 7 feet 6 inches wide and 7 feet 10 inches high with a dry weight of 1400 pounds and a hitch weight of 100 pounds. The 17 foot model will sleep several people; the dinette converts into sleeping areas. For the do it yourself folks Burro kits are available in a 14 and 17 foot option for you to build your own light weight travel trailer. The kit includes detailed assembly instructions and is estimated to take between 40 and 80 hours with simple hand tools to construct. Other kits are available to add options to your new trailer such as: a wood group with table tops, trim, cabinets and more. An appliance kit includes a stove, propane tank, ice box, water tank, and roof vent. The electric kit includes GFI outlet and wires, furnace mount lights, etc and the decorator's kit includes curtains, cushions and upholstery items. 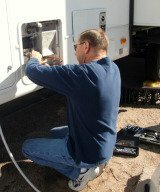 These attractive and small travel trailers can be a cozy alternative small RV for extended traveling.